The Mitel 6867 SIP Phone is designed for power users who demand a lot from both their phones and their networks. The Mitel 6867 provides remarkable HD wideband audio and an enhanced speakerphone that uses advanced audio processing to achieve richer and clearer hands-free conversations. Supporting today's high speed networks through DUAL Gigabit Ethernet ports, the 6867 offers a large colour backlit LCD display, 6 programmable soft keys, four programmable context-sensitive keys and native DHSG*/EHS headset support. 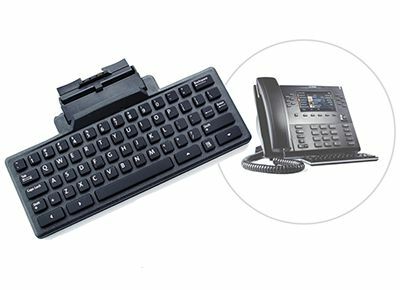 When equipped with an optional detachable keyboard and up to three expansion modules, the 6867 becomes a robust, productivity-enhancing desktop communication tool. With its fully customizable hard key layout, XML capabilities and an environmentally efficient PoE class 2 rating, the Mitel 6867 is one of the most advanced SIP desktop phones available on the market today. All Mitel 6800 series SIP phones feature Mitel Hi-Q audio technology to deliver enhanced performance and voice clarity. Integrating HD wideband audio codecs, advanced audio processing, and hardware components that support a true wideband frequency range, the 6869 offers a superior voice experience on each audio path - handset, speakerphone or headset port - making conversations crystal clear and more life-like. The Mitel 6867 SIP Phone features a high resolution 3.5" QVGA colour backlit LCD display that delivers a rich visual presentation to maximize productivity. The large colour display, combined with icon-based navigation menus and intuitive user interface, makes the many powerful telephony features of the 6867 instinctively easy to use. The Mitel 6867 SIP Phone offers USB headset support and features an innovative headset support that uniquely provides dual support for DHSG/EHS and modular 4-pin headset connections. Users with wireless headsets that support DHSG/EHS can now connect directly to the 6867 using standard third-party cables. *DHSG is a German acronym for Drahtlose Hör-Sprechgarnitur which means "Wireless Headset"
All Mitel 6800 series SIP phones have been designed with the environment in mind. 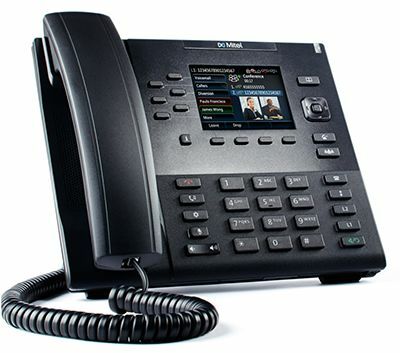 Using dynamic PoE class reporting, the Mitel 6867 has a PoE Class 2 rating that automatically switches classes when an expansion module is connected, enabling the phone and network switches to effectively manage power consumption. The Mitel 6867 SIP Phone also supports an optional Efficiency Level "V" compliant power adapter, if required. With smaller packaging that includes 100% recycled and biodegradable material, the Mitel 6800 series SIP phones comprise one of the most environmentally friendly family of SIP phones on the market.